Published September 4, 2012 By Anna T. This post may contain affiliate links. Regardless, I only recommend sites I've researched and/or used and trust. Writer's Domain is a website a lot of freelancers are using that I've been hearing about lately. I have not signed up for this one myself, but I did a lot of digging around online about it so I could provide some useful details for you if it interests you. 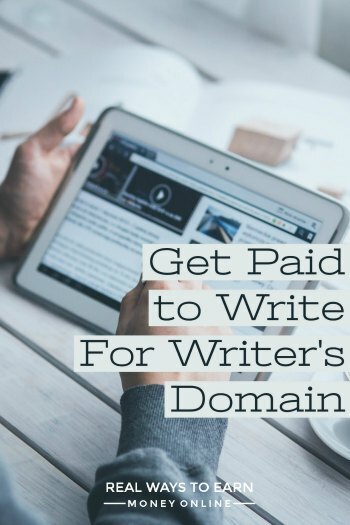 How much does Writer's Domain pay? As of March 1, 2014, Writer's Domain made some changes. They were previously paying a fairly low rate for easy-to-write articles, but now they are only accepting high-quality content. They are paying $20 for standard 400+ word articles and $40 for premium 600+ word articles. When does Writer's Domain pay? Payments are made via Paypal once a month on the fifth. Once you have earned $100 with the company, you can request your earnings at any time without having to wait to receive it monthly. What kind of writing do you do for Writer's Domain? This appears to be mostly SEO centered stuff. There are topics/keywords available to choose from when you log in. You just need to create a short piece along with a title around the keyword/topic you choose. After you submit your content, you'll have to wait for it be reviewed. This could happen fast or it could take several weeks. You must be proficient in English and the language you’re writing in, if it’s not English. If you aren’t writing in your native language, you should be fluent enough to write quality content. Writers must be able to work in the United States, have an Internet connection, and accept and abide by the Terms of Service. Basic spelling and grammar skills are also expected. Applying involves registering yourself and then sending them a writing sample. They will give you keywords to choose from for the sample. You will also have to take a timed grammar test. It could take them a while to review your app after you send everything in, so just be patient. Is Writer's Domain open to countries outside the U.S.? This I am not clear on. Their requirements state that you must be eligible to work in the U.S. yet their FAQ says they have writers working remotely in other countries, including Canada and France. I have sent them an email to get some clarification on this, and I'll try to let you know when I hear back. It seems that this was a really popular place to write for for a long time, but they've recently informed their writers they will be cracking down on “fluff” submissions and keeping a closer watch on quality, etc. Writer's Domain is not accepting new writers at this time, but keep your eye on this page to see when that changes so you can get your app in. There is also a Facebook Group for Writer's Domain you can browse through (it doesn't appear to be a private group) where annoncements, etc. are posted. This is the most profitable route to take as a freelance writer. You can get your own clients and set your own rates, which you cannot really do with Writer's Domain or other content sites. A six-figure income is not outside the realm of possibility when you're running your own business. NOw WD has dropped payrates again. Hello,which account are you using now? I agree with above comments about not enough work and how it used to be reliable. They hired extra writers last summer to cover the backlog and we still battle for keywords daily. The first of the month drop is gone in less than 30 hours.I think the problem for discrepancy in reviews is the ‘editors’ are mostly college students for their Boostability.Im in my 40s and still cant grasp an 18-20 yr old editing my work. There’s seldom editing on weekends and reviews an take up to two weeks. I mean dont’ get me wrong I can make good side money there, but the over-hiring last year during the backlog has made more writers than work, lag in reviews, and then the varied reviews are pitfalls . However, if you can figure out what they may want, there is money to be made since not many sites pay that much for an article. I just consider it side income. Anyone who thinks different may be disappointed.WD says on the FAQ page not to count on them as steady income. When they improved their pay, they also had to hire a whole bunch of new editors to keep up with demand. Unfortunately, those editors vary greatly in what they want… What will get 5 stars from one editor will get rejected by another. What started out as a great and reliable opportunity fizzled out. I cannot recommend Writer’s Domain any longer. I know the struggle SBat, I know the struggle….I started out at writers domain making 200 or more a week, now I have to scramble just to get fifty bucks. not fun! They have changed their payment system again. They pay $15-$17.50 per 400 word article. However, there is NO WORK available- ever. Writers have to get up at 2 AM just to snag a keyword nobody else wants. The pay is decent, but most writers are only able to grab maybe 1 keyword to write about a day. They have too many writers and not enough work going around. They are also not currently accepting applications, which is good. More writers who are broke and starving- not good. I just got on with them. They are still currently hiring. (as of today) Writing sample and grammar test are still required. Hi, I have been writing on iwriter for a long time now. I have read your posts and realized there are more open opportunities out there. I would like you to help me apply for an account. Please revert via my email. Thanks. Writers Domain recently changed their business model. They now offer longer, higher-quality articles. More research is involved, and the premium articles require citations. The pay is $20 for standard 400+ word articles and $40 for premium 600+ word articles. There is no longer a bonus for quality because the lower quality articles—ones that previously would not qualify for bonus—are no longer accepted. The change just occurred on March 1. They are not hiring new writers at this time, but who knows how many of the current writers will adapt to the new standards. I appreciate your sharing this new information. I had no idea. I will go and update the review. I am not sure Janelle. I know they need English speaking, so it may let you sign up. You can try it and see if it stops you at any point. Hi Janelle, I know this is an old post; but just in-case you didn’t find out before I wanted you to know that they are. WritersDomain.net is currently hiring great writers! Registration is simple and once you’re in, you can get started writing right away. Some of the information on WritersDomain has changed since this blog post and you can read the Writing Guidelines and FAQ on WritersDomain.net to learn exactly how everything works. Thank you for sharing, Jeremy. I like to keep my information as up to date as possible, so I will go over and read for myself about the changes and make the updates. How long has it been that they have had the hiring page closed? Scott, I’m pretty sure they’ve been hiring within the past few months. Just keep a watch on it. It will probably open back up soon, and rest assured that I’ll be watching it, too, and I’ll report on it when I know they are hiring again.